The growth of insurance plans built around small networks of health-care providers is fueling new fights over surprise medical bills, when patients inadvertently get care from out-of-network doctors. Providers and insurers are blaming each other for sticking patients with higher bills in such cases, and nearly two dozen states have passed or are considering legislation to protect consumers. “This issue is taking off like wildfire,” said Betsy Imholz, special projects director at Consumers Union, which has collected stories from some 2,300 patients of surprise bills ranging from $50 to thousands of dollars. Surprise bills often occur when patients receive care at an in-network hospital, but end up being treated by an emergency physician, anesthesiologist, radiologist or other hospital-based specialist who doesn’t accept the same insurance. While the problem has simmered for years, consumer advocates say it is escalating with the rise of “narrow network” plans that contract with limited numbers of doctors and hospitals to lower costs. What’s more, nearly 75% of the plans sold on the HealthCare.gov marketplace this year offer no out-of-network coverage except for emergencies, according to consultants Avalere Health LLC. Out-of-pocket maximums typically don’t apply to out-of-network bills, so plan members can face unlimited costs. Patients can be powerless to avoid it. Cassie Ray, a policy analyst with the American Cancer Society in Fairfield, Calif., says she verified, twice, that the outpatient surgery center where she had a follow-up to a mastectomy was in her insurance network. So she was shocked to receive a $588 bill from an out-of-network anesthesiologist. “The surgery center wouldn’t even discuss it with me. They said the anesthesiologist worked for a separate company,” she says. Many of the current disputes center on the “usual and customary” rates insurers use to determine how much, if anything, to pay out-of-network doctors. Patients are typically responsible for the difference between what an out-of-network doctor charges and what their insurance pays. Prime Healthcare Services, which operates 43 hospitals in 14 states, filed lawsuits against six insurers last month, charging that they use “a flawed, secret and legally inappropriate” system to set out-of-network rates that forced Prime providers to charge patients more. In May, the American College of Emergency Physicians sued the Obama administration over a similar issue, charging that its final rules under the Affordable Care Act allow insurers to set out-of-network rates for ER doctors as low as they choose. “The problem isn’t surprise bills—it’s surprise gaps in insurance coverage,” said Jay Kaplan, president of the emergency-physicians group. It says insurers have slashed payments to ER doctors as much as 70% in recent years, and taken advantage of federal laws requiring them to provide emergency care regardless of cost. 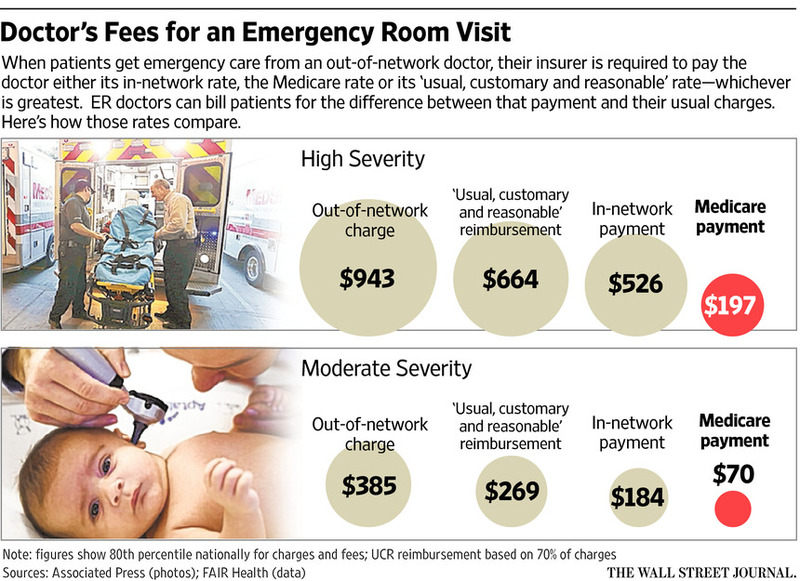 Insurers counter that more doctors are rejecting in-network rates, then charging out-of-network fees that are many times higher. For emergency care, when patients often can’t choose where ambulances take them, the ACA requires insurers to pay “reasonable” amounts to out-of-network providers and allows doctors to bill patients for the remainder, called balance-billing. 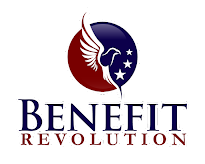 Regulations under the ACA define reasonable as “the greatest” of either the Medicare rate, the insurer’s average in-network rate or the insurer’s usual-and-customary rate for out-of-network payments. The ER physicians’ lawsuit demands that the Obama administration require insurers to use an independent database such as FAIR Health Inc. to calculate usual-and-customary rates. FAIR Health, which collects some 1.7 billion claims annually, was created in 2009 to settle charges by the New York State Attorney General’s office that insurers were significantly underestimating such rates. The ER doctors warn that insurers could underestimate those rates again unless the law requires transparency. A spokesman for the Department of Health and Human Services declined to comment on pending litigation. The insurers named in Prime Healthcare’s suit—including Aetna Inc., Cigna Corp., and Anthem subsidiary Amerigroup Nevada—declined to comment. Prime itself is facing allegations of Medicare fraud from the Justice Department, which it has denied.